A new satellite to broadcast video and data services to Russia and the Middle East was successfully released in geosynchronous transfer orbit Monday, six hours after a middle-of-the-night blastoff from Kazakhstan aboard a Land Launch Zenit rocket. The 192-foot-tall Zenit 3SLB lit its RD-171 main engine and roared away from pad 45 at the Baikonur Cosmodrome at 2100 GMT (4 p.m. EST), or 3 a.m. local time in Kazakhstan. The first stage drained its kerosene and liquid oxygen propellants two-and-a-half minutes after launch, giving way to the Zenit's second stage to continue the push toward space. The payload fairing jettisoned on time five minutes into the mission and the second stage separated from the rocket's Block DM-SLB upper stage eight-and-a-half minutes after launch. The kerosene-fueled upper stage ignited for three-and-a-half minutes to push the Intelsat 15 satellite into a low-altitude parking orbit. The Block DM engine fired two more times to raise Intelsat 15's altitude and put the spacecraft in an elliptical transfer orbit. The 5,477-pound satellite was deployed around 0330 GMT (10:30 p.m. EST). The rocket was targeting an orbit with a high point of 22,236 miles, a low point of 6,394 miles, and an inclination of 12 degrees. A ground station acquired the first signals from Intelsat 15 a few minutes later, according to Sea Launch. "I want to congratulate Intelsat and Orbital for a very successful mission," said Kjell Karlsen, president and general manager of Sea Launch. "This is the 10th satellite we've orbited for Intelsat and we look forward to launching many more satellites for you in the future." Intelsat 15 will next unfurl its power-generating solar arrays and fire its on-board propulsion system to reach a circular geosynchronous orbit over the equator 22,300 miles above Earth. The spacecraft will also deploy two 7.5-foot antenna reflectors in the next couple of weeks. After in-orbit testing, the satellite will begin operations from a slot at 85 degrees east longitude, where it will replace the Intelsat 709 spacecraft launched in 1996. Intelsat 15 will provide data and video communications services to Russia, the Middle East, and Indian Ocean regions for up to 17 years. The satellite's 22 Ku-band transponders will be attached to two communications beams focused on the Middle East and Russia. The coverage zone stretches from North Africa and eastern Europe to Siberia. Orbital Sciences Corp. built Intelsat 15 based on the company's Star spacecraft bus. The Land Launch mission is the first commercial Zenit launch since Sea Launch filed for Chapter 11 bankruptcy protection in June. Intelsat received permission from a Delaware bankruptcy court to bypass Sea Launch and make payments directly to Moscow-based Space International Services Ltd., Sea Launch's Russian partner in the Land Launch venture. Intelsat plans to launch another satellite on Land Launch in 2011. "Our relationship with Sea Launch is testament to our desire for maintaining a robust launcher industry, and today's mission marks the fourth success on their Land Launch system. 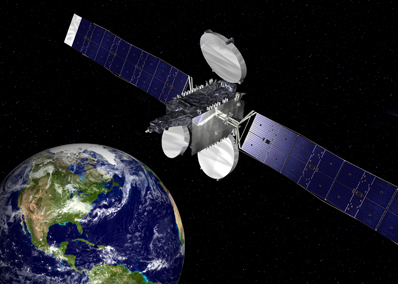 I want to thank everyone who worked diligently to ensure a flawless mission for Intelsat 15. We look forward to our next Land Launch mission that is slated to carry our Intelsat 18 satellite into orbit in 2011," said Ken Lee, Intelsat's senior vice president of space systems. Sea Launch has secured early financing to continue operations and plans to emerge from bankruptcy early next year. The ocean-based Zenit 3SL rocket could return to flight with a payload for Eutelsat by the end of 2010, according to company officials. Intelsat 15 was the third satellite launched for Intelsat in the last month. An Ariane 5 rocket launched the Norwegian Thor 6 spacecraft Oct. 29 and an Atlas 5 launcher orbited the Intelsat 14 satellite Nov. 23.